Stopping by the lounge this week is Sunshine and Kalani. After finishing up our month long Christmas party and NYE party circuit, its time to get back to normal. New Years resolutions. Not so much. But we are trying out some gluten free bar snacks at the request of a listener. Offering your guests a snack that is free of gluten is actually an easy task at the bar. Popcorn, pretzels, chips, cookies, cheese, nuts and so much more cal all be found sans gluten. And remember, all these things tend to be salty. So keep the cocktails flowing and your friends will be happy. The drink we pair with our snacks is the Shark. Not our recipe but a suggestion from a friend. Please Don't Tell is a trendy bar in NYC that boasts an extensive drink menu and has their own fully illustrated book of recipes. Although the drink menu does not give the measurements of ingredients, we do our best to recreate this creamy blue/green cocktail. Tasty. 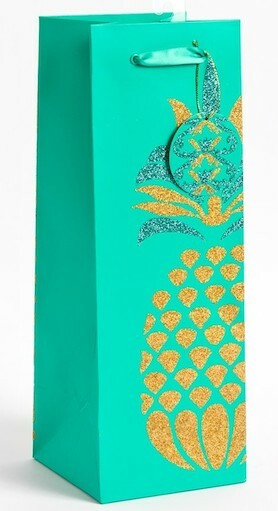 With a gift bag this fabulous, who cares whats inside, right? Subject matter on the show is fairly random. Sunshine discusses presents who's packages are better than the gift. Haven't you received a box or bag that was so well crafted that you didn't care what was inside? We certainly have. Inspired to use a wine bag in a piece of art, Sunshine will be looking for just the right application for this particular glittery creation. Kalani later goes on a rant about religious freedoms or lack of them. This is a conversation that we are both glad happened after stiff drinks. We hope that you will tell others about the podcast and share the inebriated goodness. Come back often for cocktail recipes, party tips and conversation that can only happen in a dimly lit tiki bar. A traditional pupu platter is more likely to have meats, seafood and at least one item involving bacon. But for a quick shelf stable option that is also gluten free, try rice crisps, gluten free pretzels, nuts, popcorn, dried fruits and more.